Zapotecs of the central valley of Oaxaca, embroidered blouses, back-strap woven belts and traditional dress. The heartland of the Zapotec people is the Valley of Oaxaca. This broad, Y-shaped riverine valley is not one valley, but a system of several valleys that forms the Central Valley System of Oaxaca, a state in Southern Mexico. In Spanish, these valleys are known collectively as "los valles centrales." The valley system was formed by the Río Atoyac and its tributaries such as the Río Salado. Forested mountains surround the Central Valley System. The city of Oaxaca de Juárez, a large, modern commercial and tourist center and the capital of the State of Oaxaca, is located at the junction of three of the smaller valleys (sometime called "arms") that make up the Valley of Oaxaca. These three "arms" are the Etla Valley, which extends 40 km to the north; the Tlacolula Valley, which extends 50 km to the east; and the Zaachila-Zimatlán-Ocotlán Valley, which extends 100 km south to the Valley of Miahuatlán and encompasses the Ejutla Valley. Monte Albán, the ancient capital of the Zapotec state, occupies several hills overlooking the modern city of Oaxaca. The ancestors of the Zapotecs were the earliest human inhabitants of the Valley of Oaxaca. There is archaeological evidence of hunter-gatherers living in the central valleys by 8,900 BC The cultivation of vegetable crops began between 8,000 and 5,000 BC, and by 1,500 BC Zapotec people were farming and living in settled villages in the valleys. The Valley Zapotecs speak various dialects of the Zapotec language. The Zapotec language family (which includes Zapotec and Chatino) belongs to the Otomanguean language group, which also includes the Mixtec language family. Evidence shows that Zapotec and Mixtec diverged from their common ancestor (Proto-Otomanguean) sometime between 4,100-3,700 BC. Today, most Zapotecs are bilingual in both Zapotec and Spanish. Zapotecs comprise the largest group of indigenous people in the state of Oaxaca. Culturally, the Zapotecs are divided into four groups: Southern Oaxaca, Sierra Norte/Sierra de Ixtlán, Isthmus of Tehuantepec, and Valley of Oaxaca. The Valley Zapotecs, or "Be'ena' Za'a" (the "Cloud People"), are concentrated in 67 of the 89 municipalities that make up the "valles centrales." These "municipios" are located in the districts of Ejutla, Etla, Miahuatlán, Ocotlán, Tlacolula, Zaachila, Zimatlán, and Centro. 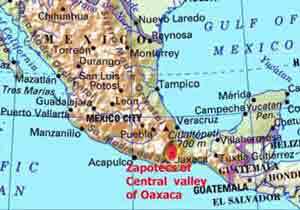 The Valley Zapotecs live in towns and villages throughout the central valleys. Groups of extended families occupy these communities, which are surrounded by agricultural land and pasturage for goats, sheep, and cattle. Traditionally, the Valley Zapotecs were farmers, growing maize, beans, chiles, and squashes. In fact, the earliest direct evidence of maize cultivation in Mexico comes from the site of Guilá Naquitz near the modern town of Mitla. Few families can sustain themselves through farming today because agricultural plots have grown too small due to the repeated subdividing of land within families. And as the population of the valleys grows, agricultural land is given over to housing and commercial development. Many Zapotec families rely for most of their income on wage labor in Oaxaca City, or in other cities in Mexico and the United States. Thousands of Valley Zapotecs have migrated to the U.S. - mainly to Southern California - but there is a large Valley Zapotec community in the Racine, Wisconsin area. Money sent home by these migrants has spurred the construction boom in the "valles centrales." Other Zapotec families have turned to craft production for the major part of their income. There has long been a high level of craft specialization among the Zapotec villages of the Oaxaca Valley. Some villages produce crafts for the domestic market, such as the red pottery of San Marcos Tlapazola and the reed baskets of San Juan Guelavía. Other communities are known for their food - the cheeses of the Etla District - and beverages - the famous mezcals of Matatlán. Artisans in many towns produce crafts for the international art market, such as the wooden figures of Arrazola and Tilcajete; the black pottery of San Bartolo Coyotepec; and the wool rugs of Teotitlán del Valle. These "artesanias," and many other items, are sold in Oaxaca City and at a series of rotating daily markets held in the major towns of the Oaxaca Valley. "Surfing" the internet will also lead potential buyers to sophisticated web sites created by Zapotec artisans to market their products (and also to Zapotec tour operators in the Oaxaca Valley). Despite their technological prowess, Valley Zapotecs still retain many aspects of traditional religion and culture. The old deities are still worshipped, even as communities host fiestas in accord with the Catholic ritual calendar. Many villages, such as Tlacolula and Teotitlan del Valle, are known for spectacular festival processions known as "calendas" or "convites," which include hundreds of participants. Valley Zapotec men have given up their traditional costume of shirt and pants made of "manta" fabric, though some older men still wear huaraches and palm hats with their Western-style clothing. In some villages, only older women still wear traditional Valley Zapotec clothing, while in more conservative communities both women and girls wear traditional costume. This "traje" generally consists of two blouses (an embroidered underblouse and a more Western-style overblouse), a wrap skirt (often of a plaid fabric), an underskirt or slip, and a woven sash called a ceñidor. A bib apron is often worn over this costume. Traditional women wear their hair in braids, which are often tied atop their heads with colorful ribbons. In some villages, women use rebozos or scarves as headwraps. The Valley Zapotecs are among the most extensively documented indigenous people in Mexico. Archaeologists and anthropologists have studied the Valley of Oaxaca and its inhabitants for many years and have produced a large number of scholarly books about the "valles centrales." In addition, a great number of (often colorful) books that focus on the production of various Zapotec crafts are available in Spanish and English.